Are you refering to multi-line string (HERE-DOC kind of thing in terms of PHP/Ruby)? Я согласен - что IDE - делает здесь все правильно. Но мне надо, что бы на многострочные переменные IDE d *.js не ругалось. 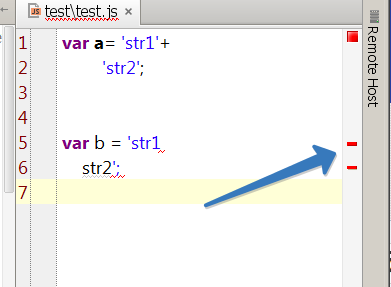 As far as I'm aware it's not possible as such check is done on low (parser/lexer?) level and not as individual inspection and therefore such error cannot be disabled/suppressed. Unless, maybe, this file can be associated with that another JS flavor (if it's supported by IDE, of course) where that is not treated as an error (sorry, just a thought -- not a pro in JS so just a wild guess). При переводе поззунка в "None" ошибка остается. Может можно указать эту ошибку как молоприоритную?